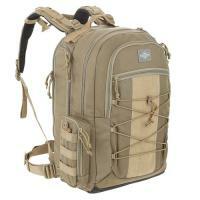 Maxpedition PT1491K Ordnance Range Backpack FREE SHIPPING! Ergonomic full featured backpack with a dedicated pocket for dual pistol cases (included). MAXPEDITION® GUN CASES & RANGE BAGS Designed to fit most standard pistols and rifles, Maxpedition gun bags store easily with padded compartments to keep your weapons and components secure and scratch-free. Chosen by tactical officers, competitive shooters and sportsmen worldwide. CCW Compartment size: 13"(L) x 1"(W) x 19"(H), and the zipper opening is 13.75"(H) This compartment fits a laptop that is 15.4" or smaller. ©2002-2019 CopsPlus.com: Maxpedition PT1491K Ordnance Range Backpack FREE SHIPPING!